Winterking from the Fire Lily Collection | A wintry pearl white base with turquoise shine, filled with black holographic glitters and blue iridescent glitter accents. Opaque in 3-4 coats; this one is designed to be more sheer so it layers up really nicely with the black glitters, but you can wear it over white/grey if you prefer. 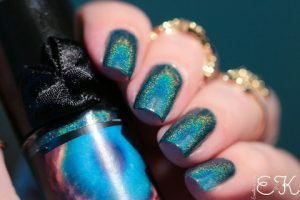 We recommend a glossy topcoat suitable for glitters.